Every once awhile, people post a list of the good non-traditional games that they play on their cabinet. I usually read this list and say, "I have to try that game out." And when I get around trying that game out. I usually forget what game I was looking for to try out. And I can't find that post that listed the games to try. Since the topics on the main forum move so fast. Sticky this post under the "Everything Else" and people can either post a list of the non -traditional games they play or even easier past a link to the posting that had that list of good games to try out. Here's a post that talks about the "Dreamcast games must haves"
Post regarding "Multiple 4 ways games"
So if people could just post their list of games that the majority of the people don't normally play or link to an older post. Other people may enjoy a "new" game that they never even heard off. Sounds like a good idea. If it tanks, we can always kill it and unsticky it. Moving...NOW! I hope people like the idea and post there lists here. As I like hearing about those known games that I've nevered heard of before. I believe that thread, howard, is more aimed toward non-mame games, while this one is more about mame. I could be wrong on this, so feel free to correct me. I actually posted this in the Software forum, but Peale switched it here. This is for the MAME game lists that usually get posted in the Main Forum section and I just wanted a place to bookmark those posts. Also a place for people to post what other "non-traditional" games they play. WindJammers is a fun game for two players. Frisby dodgeball. I think Chicken Shift is fun. He he my wife loves Chicken Shift and Burger Time for some reason. My favourites are Defender ( haven't got the control panel for it unfortunately ), Joust, KikiKaikai, Juno First, Ghosts & Goblins and many others of course. I just got my track ball...and I have to say a trackball game that I had never even heard of before called "Ataxx" is really excellent. The AI is great and I find it to be really challenging. It's very similar to Othello (remember that?) but a lot harder. I also like that when your computer opponent makes a particularly good move it laughs at you. I really like that goading into trying to beat the AI. Lately I've been playing a lot of Shuuz and Shuffleshot. Both great trackball games. And I have to agree with Mr. Do...what a great simple game. I think it's called 'Egg Venture' and it's lots of fun. Shoot eggs! Here's another list of "The best games I've nevered played"
Here's a post regarding Golf games for you mame cabinet. Gotta try "The Speed Rumbler"...Capcom was ahead of their time with this one. When your car catches fire, you can jump out of it and try to survive on foot with a shotgun and a somersault roll/dodge type manuever. Stay alive long enough, and your people bring you in a new car to get into into. Nothing is more satisfying than hopping out of your flaming heap, running around nilly willy trying to stay alive with guys shooting at you and cars trying to run you over to finally make it to your new ride and give those bastardds what they came for...SWEET!! Plus, there is a time limit that keeps it's time even if you continue, so the pressure is still on even though credits are not a factor. If Capcom had only let you steal enemy cars...this would have been Grand Theft Auto's great-great-grandad! Dumb questions deserve dumb answers. I was just stuck on the P's tonight. I played Penguin Brothers and Penguin-Kun Wars. I thought they were kinda fun. Penguin Brothers is kind of like bomber man combined with bubble bobble. In Penguin-Kun Wars, you throw balls at eachother and whoever has least balls on their side after the time expires wins. That description may sound really bad, but give it a try...it was alright. Here's a posting listing games for the wife. Midnight Riders is a great game, a little cheesy but loads of fun. 2 Player games on a Cocktail cabinet. A friend recently referred me to a game called Outfoxies. Seems like a pretty cool game, but I haven't been able to try it on real arcade controls (just keyboard). Here's a post that talks about games for the Women in your Life. Here's a post of games that use a Star Wars Yoke type joystick. I bought a Megazone board on ebay recently and I just keep playing it and playing it. 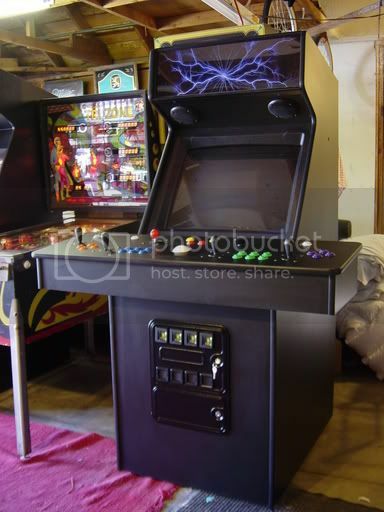 List of 4 player games for a cocktail cab. My favorite game which I never heard of --BINGO! Either that, or I was attempting to say "before" but it was too many letters to type-- mame is probably Snake Pit. The trackball & stick combo is a great touch imo. I'd never heard of Puzzle Fighter until someone here mentioned it. Truly addictive! !